A philanthropic foundation is a legal categorization of nonprofit organizations that either donate funds and support to other organizations, or provide the sole source of funding for their own activities. However, the United States Internal Revenue Code distinguishes between private foundations (usually funded by an individual, family, or corporation) and public charities (community foundations and other nonprofit groups that raise money from the general public). Private foundations have more restrictions and less tax benefits than public charities like community foundations. These foundations take different forms throughout the world. A philanthropic foundation is a way to live for the sake of others by supporting worthy causes that are for the betterment of society as a whole. Since it is difficult for people to provide these services directly and individually to the wider society, establishing such a foundation is a way for people with the desire and finances to help others, but not necessarily the ability or opportunity, to do so. A philanthropic foundation is a permanent fund established and maintained by contributions for charitable, educational, religious, research, or other benevolent purposes. It generally takes the form of an institution or association given to rendering financial aid to colleges, schools, hospitals, and charities and generally supported by gifts for such purposes. The term "foundation" originates in civil law jurisdictions, where it is used to describe a distinct legal entity. A foundation has legal personality, and is entered in a public registry like a company. Unlike a company, it has no shareholders, though it may have voting members. It holds assets in its own name for the purposes set out in its constitutive documents, and its administration and operation is carried out in accordance with contractual rather than fiduciary principles. The foundation has a distinct patrimony independent of its founder. Foundations are often set up for charitable purposes. The foundation finds its source in institutions of medieval times when a patron would establish a foundation to endow a monastery or other religious institution in perpetuity. The act of giving wealth to benefit society is known as philanthropy, and individuals who establish these types of foundation for such purpose are philanthropists. George Peabody and James Smithson are well known early philanthropists. Peabody personally began the systematic program of donations which made him the world's first great philanthropist. The bulk of his fortune went to various scientific and educational institutions and to programs supporting the poor of England and the United States. 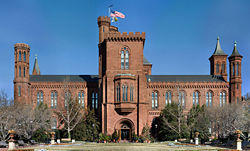 Smithson's will arranged that his fortune, barring any heirs, be donated to the United States government to establish a center of knowledge for the public, which became the world famous Smithsonian Institution. A Carnegie library, Macomb, Illinois. The two most famous philanthropists of the Gilded Age pioneered the sort of large-scale private philanthropy of which permanent charitable foundations are a modern pillar: John D. Rockefeller and Andrew Carnegie. These businessmen each accumulated private wealth on a scale previously unknown outside of royalty, and each in their later years decided to give much of it away. Carnegie gave away the bulk of his fortune in the form of one-time gifts to build libraries and museums. Rockefeller followed suit (notably building the University of Chicago), but then gave nearly half of his fortune to create the Rockefeller Foundation. By far the largest private permanent endowment for charitable giving created to that time, the Rockefeller Foundation was the first to become a widely understood example of the species: a standing charitable grant-making entity outside of direct control by any level of government. Starting at the end of World War II, the United States' high top income tax rates spurred a burst of foundations and trusts being created, of which many were simply tax shelters. President Harry S. Truman publicly raised this issue in 1950, resulting in the passage later that year of a federal law that established new rigor and definition to the practice. The law did not go very far in regulating tax-exempt foundations, however; a fact which was made obvious throughout the rest of that decade as the foundation-as-tax-refuge model continued to be propagated by financial advisers to wealthy families and individuals. Several attempts at passing a more complete type of reform during the 1960s culminated in the Tax Reform Act of 1969, which remains the controlling legislation in the United States. Favorable income tax laws in the 1940s further spurred philanthropic activity. During the early 1950s many American foundations were attacked by right-wing journalists and Congressmen; between 1950 and 1953, the House of Representatives conducted two separate investigations into “subversion and Communist penetration” of the nation's philanthropic foundations. Attacks on the foundations began to subside, however, with the passing of the so-called McCarthy era. The 1980s and 1990s saw a doubling in the number of grantmaking foundations, including those developed by financier George Soros and Microsoft founder Bill Gates. Due in part to economic prosperity, foundation giving doubled between 1990 and 1998 to $19.5 billion. In 1997, the largest recipients of grant dollars were education, health, and human services. The United States Internal Revenue Code defines many kinds of non-profit organizations which do not pay income tax. However, only charities can receive tax-deductible contributions and avoid paying property and sales tax. For instance, a donor would receive a tax deduction for money given to a local soup kitchen (assuming it has filed the proper 501(c)(3) documents), but not for giving money to the National Basketball Association, even though the NBA is a non-profit association. Tax-exempt charitable organizations fall into two categories: public charities and private foundations. Community foundations are considered public charities. Community foundations are instruments of civil society designed to pool donations into a coordinated investment and grant making facility dedicated primarily to the social improvement of a given place, or community. In other words, a community foundation is like a public foundation. This type of foundation requires community representation in the governing board and grants made to improve the community. Often there will be a city that has a community foundation where the governing board comprises many leaders of the business, religious, and local interests. Such grants that the community foundation would then make would have to benefit the people of that city. A typical example would be the Cleveland Foundation. Express public involvement and oversight in community foundations allow their classification as public charities rather than private foundations. Private foundations typically have a single major source of funding (usually gifts from one family or corporation rather than funding from many sources) and most have as their primary activity the making of grants to other charitable organizations and to individuals, rather than the direct operation of charitable programs. When a person or a corporation founds a private foundation frequently family members of that person or agents of the corporation are members of the governing board. This limits public scrutiny over the private foundation, which entails unfavorable treatment compared to community foundations. For tax purposes, there are a few variants of private foundation. The material difference is between "operating" foundations and "grant-making" foundations. Operating foundations use their endowment to achieve their goals directly. Grant-making foundations, like the Rockefeller Foundation, use their endowment to make grants to other organizations, which indirectly carry out the goals of the foundation. Operating foundations have preferential tax treatment in a few areas including allowing individual donors to contribute more of their income and allowing grant-making foundation contributions to count towards the five percent minimum distribution requirement. In the United States a foundation is a type of philanthropic or charitable organization set up by individuals or institutions as a legal entity (a corporation or trust) with the purpose of distributing grants to support causes in line with the goals of the foundation or as a charitable entity that receives grants in order to support a specific activity or activities of charitable purpose. In the United States, "foundation" has no special legal status (unlike "incorporated"), so foundations do not always have the word "foundation" in their name, while for-profit and public charities, that one would not consider to be a foundation, may use the word "foundation" in their name. The status of an organization is determined not by their name but by federal tax code as interpreted by the Internal Revenue Service. Many philanthropic and charitable organizations are considered to be foundations. However, the Internal Revenue Code distinguishes between private foundations (usually funded by an individual, family, or corporation) and public charities (community foundations and other nonprofit groups that raise money from the general public). Private foundations have more restrictions and less tax benefits than public charities. The Tax Reform Act of 1969 defined the fundamental social contract offered to private charitable foundations, the core of which has been imitated in law by other nations. In exchange for exemption from paying most taxes and for limited tax benefits being offered to donors, a charitable foundation must (a) pay out at least five percent of the value of its endowment each year, none of which may be to the private benefit of any individual; (b) not own or operate significant for-profit businesses; (c) file detailed public annual reports and conduct annual audits in the same manner as a for-profit corporation; (d) meet a suite of additional accounting requirements unique to nonprofits. Administrative and operating expenses count towards the five percent requirement; they range from trivial at small understaffed foundations, to more than half a percent of the endowment value at larger staffed ones. Congressional proposals to exclude those costs from the payout requirement typically receive much attention during boom periods when foundation endowments are earning investment returns much greater than five percent; the idea typically fades when foundation endowments are shrinking in a down market. In England, the word foundation is sometimes used in the title of a charity, as in the British Heart Foundation and the Fairtrade Foundation. Despite this, the term is not generally used in English law, and (unlike in civil law systems) the term has no precise meaning. Foundations in Canada collectively comprise a very large asset base for philanthropy. As of 2003, there were over two thousand active grantmaking foundations in Canada, who had total assets of twelve and a half billion dollars CAD, with total grants given that year of over one billion Canadian dollars. Under Canadian law, foundations may be public or private, but both are charities. In Canada under Canadian law, foundations may be public or private, but both are charities. They collectively comprise a large asset base for philanthropy. Many successful Japanese corporations have established foundations for philanthropic work, an activity in keeping with their company vision. Toyota Motor Corporation established the Toyota Foundation in 1974, with the goal of advancing the happiness of individuals, and thereby to contribute to "greater human happiness." Numerous foundations in Japan exist that are supported by a corporate parent. Generally, however, they are not tied directly to the profitability of their parent corporation, but enjoy an independent existence. As the president of the Toyota Foundation notes, "by contributing to society in this manner, Japanese corporations have created a special kind of private organization that they can be justifiably proud of on a global basis." Additionally, a number of Japanese corporations that have established foundations in America, based on their success in the US. Thus, the American Honda Foundation was established in 1984 in conjunction with American Honda's 25th anniversary in the United States. It was established to say "thank you" to the American people for their support through the years. Other Japanese corporations establishing philanthropic foundations in the US include Sony Corporation of America and the Panasonic Foundation. Such philanthropic activity stems from a corporate philosophy built on the basic principle of respect for the individual and sharing joy with our customers, associates (employees) and society. Foundations in Spain are organizations founded with the purpose of not seeking profit and serving the general needs of the public. Such foundation may be founded by private individuals or by the public. These foundations have an independent legal personality separate from their founders. Foundations serve the general needs of the public with a patrimony that funds public services and which may not be distributed to the founders' benefit. A foundation in Sweden is a legal entity without an owner. It is formed by a letter of donation from a founder donating funds or assets to be administered for a specific purpose. When the purpose is for the public benefit, a foundation may enjoy favorable tax treatment. A foundation may have diverse purposes, including but not limited to public benefit, humanitarian or cultural purposes, religious, collective, familiar, or the simple passive administration of funds. Normally, the supervision of a foundation is done by the county government where the foundation has its domicile, however, large foundations must be registered by the County Administrative Board (CAB), which must also supervise the administration of the foundation. ↑ Council on Foundations (2001) Tax Treatment of Charities. Retrieved October 18, 2007. ↑ Council on Foundations (2007) Foundation Basics Defining Philanthrophy. Retrieved October 18, 2007. ↑ IRS Internal Revenue Service IRS Types of Foundations United States Department of Treasury. Retrieved October 18, 2007. ↑ Atsuko ToyamaPresident's Message Atsuko Toyama President, Toyota Foundation. Retrieved November 10, 2007. ↑ Mission Statement American Honda Foundation Retrieved November 10, 2007. ↑ Philanthropy Honda in America Retrieved November 10, 2007. Burlingame, Dwight F. 2004. Philanthropy in America: A Comprehensive Historical Encyclopedia. ABC-CLIO. ISBN 978-1576078600. Dowie, Mark 2001. American Foundations: An Investigative History. The MIT Press. ISBN 978-0262541411. Hammack, David C. 1998. Making the Nonprofit Sector in the United States. Indiana University Press. ISBN 978-0253214102. Roelofs, Joan. 2003. Foundations and Public Policy: The Mask of Pluralism. State University of New York Press. ISBN 978-0791456422. Salamon, Lester M. et al. 1999. Global Civil Society: Dimensions of the Nonprofit Sector. Kumarian Press. ISBN 978-1565491847.